We all love living the modern day lifestyle, where everything around us is so much more convenient than what our forefathers had to live with. From wireless connectivity to virtually anywhere and everywhere which we go to, we are also able to enjoy an untethered lifestyle to boot. When it comes to music, the traditional pair of headphones simply will not do as these tend to get all tangled up in a mess even if you leave it alone, as though it has a life of its own. This is where wireless connectivity has plenty of advantages: you do not have to worry about wires getting in your way, and neither do you need to be restricted in your movement any more while enjoying your favorite tunes, especially the extra active folks. Erato’s Verse wireless headphones play such a role perfectly by boasting of graphene driver technology. It does not matter whether users are commuting, exercising, or simply taking calls at the office, Verse is able to produce uncompromised sound quality through a wire-free, sleek, compact, and minimalistic design which is ideal for anyone who is always on the move. Making use of graphene is a conscious choice, allowing for the development of a thin and flexible 5.8mm driver which can amazingly reproduce a stronger, richer, and more accurate sound sans carrying around additional weight or resulting in distortion. Making use of such advanced material technology, Verse is able to perform extraordinarily well from deep bass to sparkling treble. 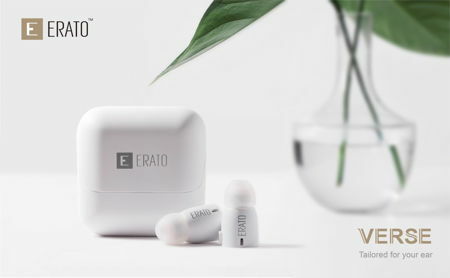 Tipping the scales at a mere 4.5 grams per earbud, which is roughly two dimes, you most probably won’t be able to feel that it is there in the first place. With SpinFit silicone eartips, these patented eartips will enable 360-degree rotation and fit the shape of your ear canal, allowing it to go in deeper and create a better seal and superior noise isolation. It is also rated at IPX5 waterproof, meaning it is sweat-proof for you to exercise away without hesitation. The Verse has around three hours of music and four hours of talk time per charge, and the charging case can hold up to four full recharges. Expect the Erato Verse to retail for $149.99 apiece if you would like to live the untethered lifestyle from now on.